I just received the final issue of Nintendo Power. This magazine has been in my life since I was a mere lad of seven, and reading the very lovingly written final installment was a surprisingly poignant experience. Nintendo Power has been there for almost my entire life, and I read each of its 285 issues, watching as the magazine transitioned from Nintendo's in-house, map-laden PR machine to an independent collection of reviews, previews, and interviews. Way back in 1988, when one couldn't just jump onto the Internet and download a walkthrough, Nintendo Power was a repository of maps, codes, and guides. I finished a number of games with the help of that magazine, and vicariously enjoyed many more. Even all these years later, I still go back to the first few years of magazines to read up on those old games. The very final spread of Volume 285 was a comic: Nester & Max; a very touching tribute that pays homage to the monthly comic of the magazine's early days, Howard & Nester (originally drawn by the unbelievably talented 今井修司 [Shuji Imai], whose name I finally tracked down after seeing his illustrations credited in the Japanese guide book to Castlevania III). Nester, now all grown up and with a son, reads the last issue of the comic and puts it on the shelf before going off to join his son Max for a game on the Wii U. 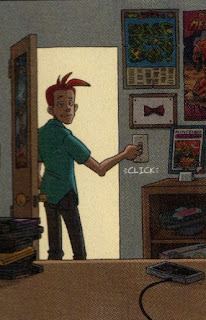 The comic is filled with references to Nintendo Power's history; the writer and artist (Chris Slate and Bill Murdon, respectively) clearly put a lot of love into the magazine's send-off. Reading it, I felt a profound sense of nostalgia combined with a deep sense of loss, and suddenly realized that tears were running down my cheeks. The comic is very touching, and, for me, very resonant. Nintendo Power has, in many ways, been a centerpiece of My Life in Videoland. Which is why, after a year-and-a-half's unintended hiatus, I am determined to resurrect this blog. Goodbye, Nintendo Power. Thank you for the past 24-and-a-half years. You will be missed. I told you you'd have at least one new reader.